Are you using social networks effectively? 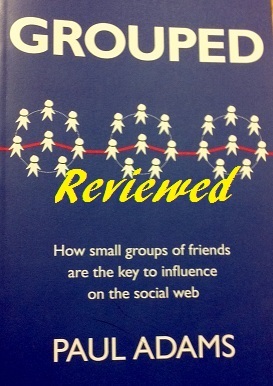 Subtitled as How small groups of friends are the key to social influence, this really does express the author’s point of view throughout the entire book, and is what he feels is the key to marketing in the social world. Grouped by Paul Adams , is a short book at just 150 pages, this was some easy bus reading. 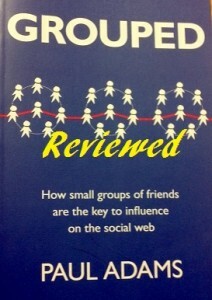 The book begins with some background on how humans are social and why they communicate. Summary of the first two chapters: you’re social, so you talk. You are kind and generous. The next two chapters are better, as the influence of your connections is explored along with who you are connected to. The author details that on average each of us have 4 to 6 primary groups that we are a part of based on experiences or interest, such as our college group, our drinking group, our work group, and others. The groups are usually fairly distinctive, without a lot of overlap between members. Mentioned also is that when the groups do come into contact with each other, like at a birthday party, it’s usually a bit awkward as our actions are defined by our group. The author also says, obviously, that we have stronger connections to fewer people. 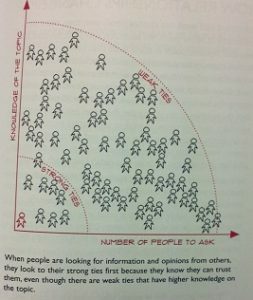 On average, our strongest connections are just to 5 people, and then every group of connections outside this grows by a factor of 3. So we have 5 of the strongest connects, 15 of our very close friends, 50 good friends, etc. We act as a unique intersection between these various groups of connections and out groups. This is the key as the author sees it. Following this idea of the unique intersection, the author says that we can be influenced most by our friends. Given that our friends are influenced most by their friends, and their friends are influenced by their friends, we get to being influenced by our friends, friends, friends. The influence stops there, as beyond this level, the connections are too weak. This, Adams says, is why there is no such thing as the “influential” people out there that you must read in order for an idea to go viral. He also notes that there are people who are highly connected, but that doesn’t imply that they are influential. Instead, our friends and our biases are what influence us most. Adams goes on in the next couple of chapters to tell us that the things and people around us the most influence us the most at a sub-conscience level. This is basically an adjustment to the “you are the average of the 5 people you spend the most time around” theory. Additionally, our brains have a bunch of biases. This is a pretty standard list of why your lizard brain makes you stupid and why you need to reward it. Your brain also takes cues from the world (again sub-consciously) on how to act, which of course influences you. If everyone is acting a certain way, so will you. You can be primed to act in a certain manner just by exposing you to simple images or words, even if you don’t pick up on it consciously. For example, at the end of the first paragraph I added a note about how kind and generous you are. Your brain picked up on that, and as such you’re more likely to enjoy this review, and comment afterward. The next to last chapter is actually about marketing in the social media world, and I wished that the entire book would have been more about this topic. The jist here is that people don’t trust companies or marketers, that interruption marketing will degrade into a pile of ignored noise, and that we’re more and more influenced by our friends than experts on all topics, even on topics where your friends are clearly not experts and in fact likely have worse advice. Liking companies and people give them credibility, an occasional negative comment gives you credibility, and in the future everything will be based primarily on social constructs. All in all, an OK book, but nothing particularly profound. Good background on why social media is so popular, but nothing to really help with creating content best suited for sharing in social media. Readers, what books have you enjoyed recently? Anything particular helpful that you have read lately either in your personal life or for blogs and business? After reading this book I created a Google+ page, sine you’ve read this far, I’d appreciate it if you followed me! Where is the link to your G+ page? I am on there as Jason Larkins…so you can look me up and friend me and I’ll friend you back! lol. I feel like I’m in middle school saying that. If not, just throw up your link somewhere. I need to read more social media books. I’ve fallen into the trap of reading financial, career, and leadership books. I’ve been reading Stop Acting Rich by Thomas Stanley. I like most of his work but it’s kind of redundant. If you were to read any of his work I’d recommend Millionaire Next Door. I just finished Outliers by Malcolm Gladwell. I had read the Tipping Point when I was in high school and I guess that might be why I preferred it over Outliers, but I just found this book to be a bit less “surprising” than his previous work. It was still interesting to see how much luck and chance play in the fate of the greats, but I’m glad I didn’t rush out to buy it when it was first published.